Sewing and crafting at our house takes many different avenues! 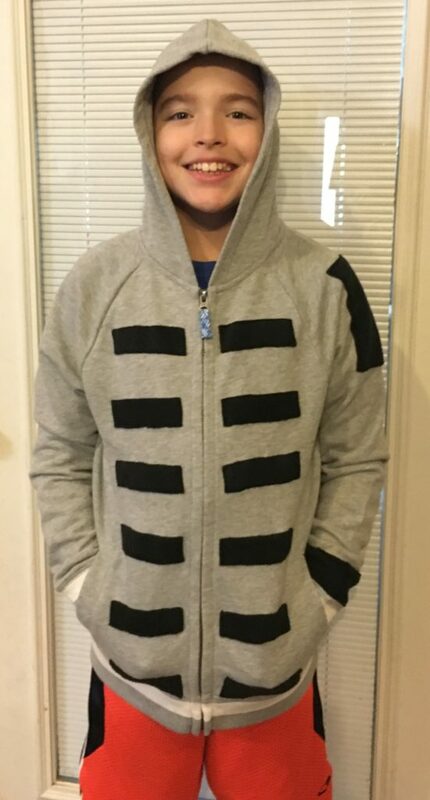 One of my grandsons (11 years old) told me that his first project was going to be decorating his school hoodie/jacket. At first I was a little apprehensive, but he assured me that he’d already been planning it “in his head”, and he knew exactly what he wanted to do. So I figured why not?? He has a solid color gray hoodie, so whatever he had in mind would “add” decorations to it. Here’s the jacket that he made, and I’ll follow that with instructions on exactly what he did. We had some black fleece left over from making the Orca Whale Tail pattern, so he cut 12 – 1″ x 4″ strips (6 for each side) and very carefully measured and pinned them in place. Then they were topstitched in place. And, because he is left handed, he also wanted to decorate the left sleeve. The top “shoulder” decoration is a 4″ x 6″ rectangle placed at the center of the sleeve at the shoulder. The last decoration was a 1″ wide strip that goes all the way around the sleeve next to the cuff. I’m very proud of his work, and I think he will have friends asking where he got it because they want one just like it! Sorry! It’s a “one of a kind”. The good thing about sewing and crafting, is that, just like my grandson, you can make lots of “one of a kind” items, OR just simply make something according to the pattern – your choice.